For human beings to feel committed and connected, they must think of themselves as part of a meaningful context. That is why the collected Qvest data is automatically structured and shared with the participants when the Qvest closes. So - now you know why the Qvest data is structured and collected the way it is. To get the most out of the data, you need to know how to think and talk about the different features in the analytics panel. The Qvest analytics panel is called The Project Success Grid because it helps you navigate between project opportunities and project risks, and thus paves the way for project success. 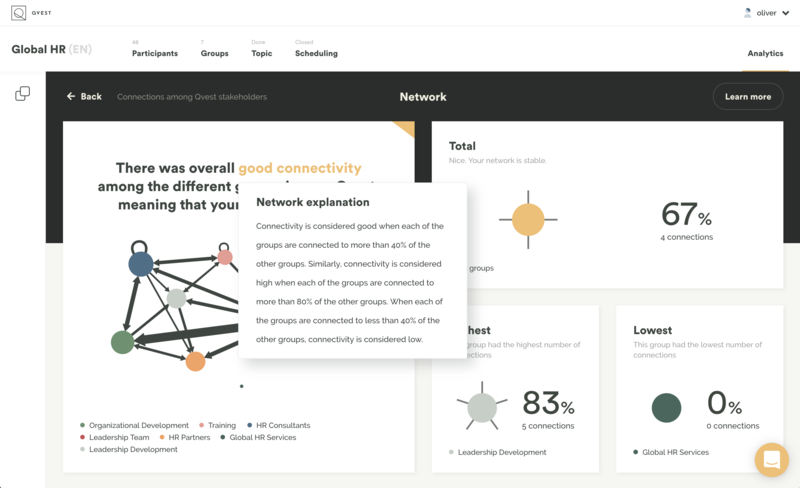 The grid consists of 3 x 3 features, which contain nine unique key findings about your specific project. The Project Success Grid displays the one key finding you should be most attentive to in each of the different features. 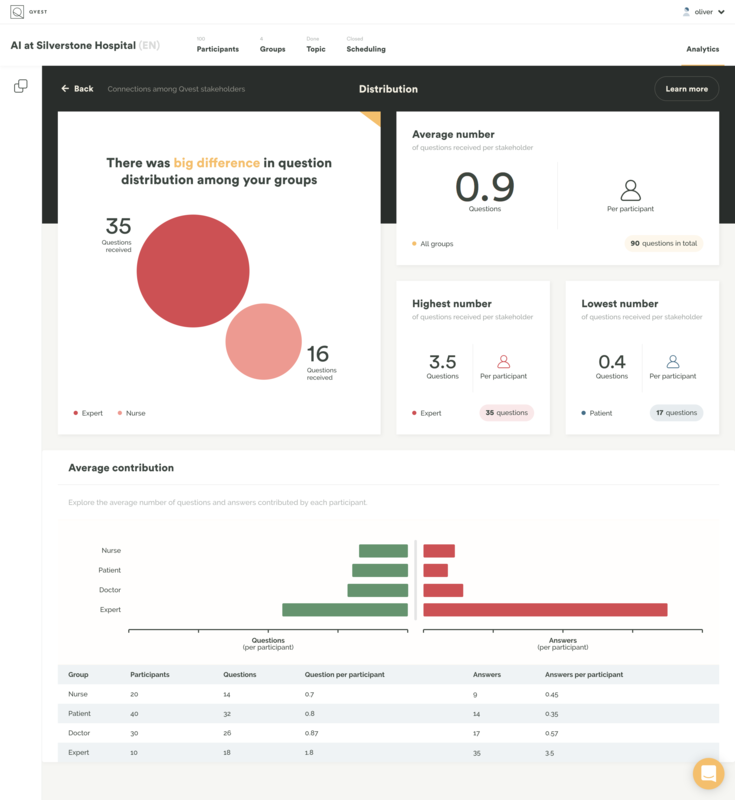 That means that when you enter the analytics frontpage you will see the nine most important findings in your Qvest project: Three key findings in each of the Commitment, Connections and Communication sections. 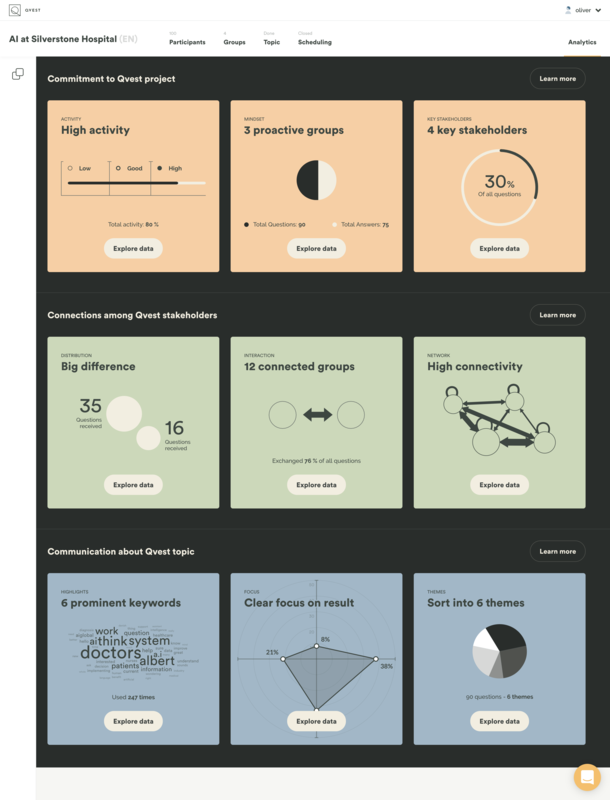 All the key findings are presented in a way that makes it easy for you to focus clearly when you set out to explore the data more thoroughly. The feature-pages are structured this way to help you consider all relevant aspects before you draw conclusions based on the output. All the texts in the Project Success Grid and the nine feature-pages are customized to your specific Qvest project. That means that all the headers, hover texts and information in the different boxes serve as guides on how to interpret and use the Qvest output. The Project Success Grid enables you to focus your decisions and behavior on the people and problems that matter the most. When you know how your different stakeholders approach the project, you also know who and what is important in order to reach project success. For every key stakeholder, strong connection and clear focus, there is a risk that other stakeholders are being left out, that other connections are weak, and that other important focal points have become blind spots. When you know who and what your stakeholders don’t pay attention to, you can ask yourself how it affects the goals you are trying to reach, and what you can do to change it. By mobilizing and mapping what your stakeholders know, what they don’t know and who they turn to for knowledge, you know all you need to know to make the right decisions about the right problems. 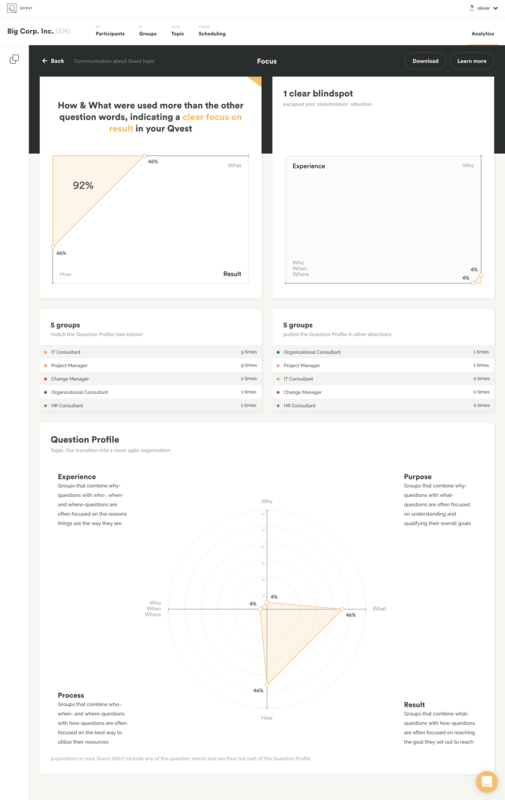 And all you have to do is pick and frame a relevant Qvest topic.